NEW ORLEANS – These NCAA Division I Regional Team Rankings released Monday may be the last edition of the 2014 season, but as the conference championships showed this past weekend, they are anything but final with Regional Championships looming in two weeks’ time. The women’s rankings were the most affected by this past weekend’s action, with three new regional No. 1s and two more squads that moved up into their regions’ second spot. On the men’s side, the lone region with significant movement at the top was the Southeast, which got a new No. 1 in Furman. Elsewhere, the top two teams in each region remained in place with several new teams lining up just outside of automatic qualifying territory. The penultimate National Coaches’ Polls of the 2014 season will be released Tuesday afternoon. For the women, both New Mexico (No. 10 nationally) in the Mountain Region and North Carolina (No. 15 nationally) in the Southeast moved up one spot to No. 1 following wins at the Mountain West and ACC championships, respectively, while the Iona women (receiving votes) leapt three spots to No. 1 following their win at MAACs. New Mexico claimed its seventh conference title in a row with a 33-58 win Friday over Boise State (No. 23 nationally). Dropping down to No. 3 in the region was Colorado (No. 7 nationally), which finished third at the Pac-12 Championships. UNC ended national No. 12 Florida State‘s six-year run atop the ACC with a decisive 57-99 win Friday morning. The Tar Heels replaced Virginia (No. 13 nationally) atop the region after the Cavaliers finished third on their home course at the ACC Championships. Iona, led by a scorching debut from last year’s national third-place finisher Kate Avery, dominated the MAAC for the 10th year in a row, 20-73 over Quinnipiac, to leapfrog Syracuse (national No. 16), Ivy League champ Dartmouth (national No. 26) and Boston College (national No. 30) in the Northeast. After starting the season at No. 14 in the men’s Southeast Region, the Paladins of Furman (No. 21 nationally) will enter regionals at No. 1. Furman moved up one spot from a week ago after claiming the Southern Conference with ease, winning 15-71 over ETSU. Making way for the Paladins – as well as one-position upward moves by NC State (receiving votes nationally) and North Carolina (No. 28 nationally) to No. 2 and 3, respectively – were former No. 1 Virginia, which fell three to No. 4 following a disappointing fourth-place finish at ACCs on its home course. Sunday’s Big Ten Championships were responsible for the two new women’s teams at No. 2. Wisconsin (No. 8 nationally) moved up in the Great Lakes after finishing runner-up to regional No. 1 Michigan State (No. 1 nationally), 26-55, and ahead of last week’s No. 2 Michigan (No. 4 nationally, but running without 2013 Big Ten Champion Erin Finn), 55-93. Minnesota (national No. 20) was fifth in that same race to step up one spot to No. 2 in the Midwest, combined with a disappointing fourth-place finish at Big 12s by Oklahoma State (national No. 21). The Cowgirls dropped from No. 2 to No. 4. The BYU women moved up a slot to No. 3 in the Mountain Region following its win at the West Coast Conference meet, trading spots with Big Sky champ Northern Arizona. No. 3 was as high as any other men’s team outside the Southeast was able to move this weekend. Penn State (receiving votes nationally) moved up to No. 3 with upsets over Indiana (No. 20 nationally) and Michigan State (No. 22 nationally) to finish third at the Big Ten Championships. The Nittany Lions passed over Ivy League champ Princeton, which fell to No. 4. In the SEC, Auburn finished third to step up to No. 3 in the South Region – a step in the right direction after falling from the region’s all-important No. 2 slot two weeks ago to No. 4. Joining the men’s rankings were Detroit (Great Lakes); Temple and Rider (Mid-Atlantic); South Dakota State and South Dakota (Midwest); Montana (Mountain); Army, Binghamton and UMass Lowell (Northeast); ETSU (South); and Duke (Southeast). New to the women’s rankings were Xavier (Great Lakes); Monmouth (Mid-Atlantic); Oklahoma and Illinois State (Midwest); Air Force (Mountain); Sacred Heart (Northeast); UCF (South); James Madison (Southeast) and UC Santa Barbara and UC Riverside (West). 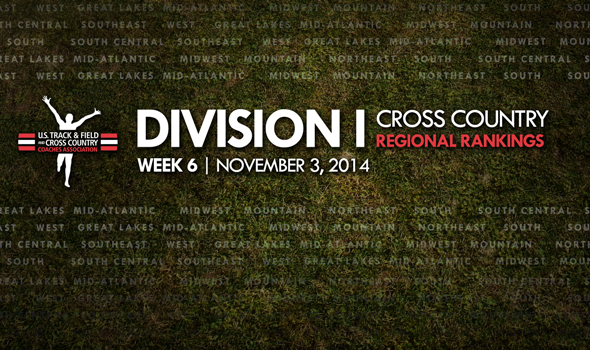 NCAA Division I Regional Championships will be held around the country Friday, November 14.